Larco Engineering supply, service and repair commercial and industrial Insulated Sectional Doors throughout Ireland. Larco Engineering supply, service & repair industrial sectional doors throughout Ireland. Both commercial and industrial insulated sectional doors can act as the main entry point for goods in any industrial unit or warehouse. 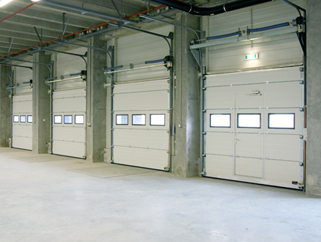 These forms of industrial sectional doors give thermal performance greater than required by building regulations. This reduces and eliminates cold bridging compared to traditional roller shutters. Windows can also be installed in single or multiple panels and doors can be pre-finished in an extensive range of colours and material. Contact Larco Engineering today on (0)21 2061 406 to discuss your industrial sectional door requirements before offering you a quality solution.